Emerson Etem stays in the lineup following a strong game against the Calgary Flames. Photo courtesy of MSG Photos. During the long break, the Rangers have been practicing and staying active ahead of Friday’s clash with the struggling Toronto Maple Leafs. The Rangers practiced both Tuesday and today, Thursday, mixing some things up in the process. Viktor Stalberg missed his first game of the season on Sunday against the Flames, dealing with a head injury. Stalberg was hit up high by Radko Gudas on Saturday against the Flyers, leaving the game in the second period and not returning since then. He didn’t practice on Tuesday, but came out afterwards and skated on his own. 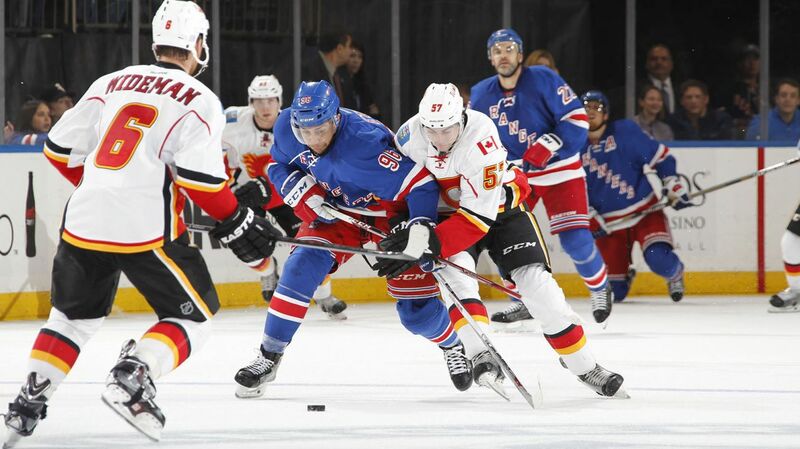 Stalberg returned to the ice with his teammates today, but told reporters that it’s “better to be safe than sorry.” Vigneault said that he would not be available for Friday’s game, but Stalberg will be ready after that. Stalberg has a goal and four assists in nine games this season, and has been an integral part of the forecheck, pressuring opponents and creating chances off the rush. That means that Emerson Etem will remain in the lineup for the second consecutive game. After going largely unnoticed in his first game with the Rangers, Etem saw more ice time and a better performance in his second game. Despite starting all of his shifts in the neutral zone or defensive zone, Etem wound up leading the team in even strength corsi of +8. He tallied his first point as a Ranger, an assist, and nearly scored on a few occasions. After an effective game on both sides of the puck, Etem will look to follow up with another strong performance. Alain Vigneault also decided to tinker with the line combinations, switching up the top six to something a bit more familiar. AV decided to reunite the combinations that worked last year, putting Derick Brassard back between Rick Nash and Mats Zuccarello, and placing longtime partners Derek Stepan and Chris Kreider back together with Jesper Fast on the right wing. 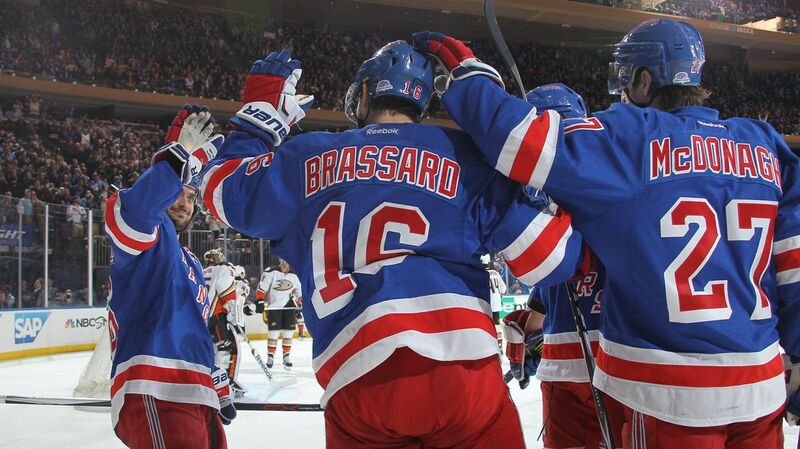 Brassard and Zuccarello are back together. Photo courtesy of MSG Photos. Bumping Brassard down a line seems to have motivated and reignited his play, scoring in two straight games, playing much better three zone hockey, and bringing his point total up to five points (3-2-5). His play will hopefully spark Rick Nash, who only scored an empty netter this season. Derek Stepan has been a bit quiet lately, with just an assist in his past four games and held without a goal since the 18th. Chris Kreider and Jesper Fast also have just a single goal, but this trio was really good during the playoffs. Kreider really needs to start scoring, and the second line need to have more of an impact. The bottom six will remain the same, which means Kevin Hayes will be centering JT Miller and Oscar Lindberg, while Dom Moore is back together with Jarret Stoll and Etem. Dylan McIlrath will be a healthy scratch for the tenth time in 11 games. The Hayes line has been the Rangers best over the past few games. Hayes is starting to find his mojo again, and the three of them combine for 25 points, more than any other line. Lindberg leads the team in goals and points with five goals and seven assists. Derek Stepan returned to practice today. He missed Tuesday’s skate to be with his wife, Stephanie, for the birth of their first child. Posted on October 29, 2015, in Rangers Updates and tagged Alain Vigneault, Chris Kreider, Dan Boyle, Dan Girardi, Derek Stepan, Derick Brassard, Dominic Moore, Dylan McIlrath, Emerson Etem, Jarret Stoll, Jesper Fast, JT Miller, Keith Yandle, Kevin Hayes, Kevin Klein, Marc Staal, Mats Zuccarello, MSG, New York Rangers, New York Rangers blog, NHL, NYR, Oscar Lindberg, Rangers, Rangers blog, Rick Nash, Ryan McDonagh, Viktor Stalberg. Bookmark the permalink. Leave a comment.